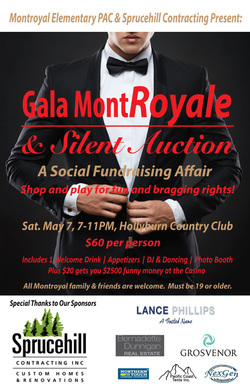 In these final weeks tickets are flying fast for Gala MontRoyale on May 7 at Hollyburn. Don`t miss out on this fantastic fundraising social with the goal of raising $20,000 towards new classroom laptops. Sponsorship opportunities are still available, for more information please contact Bernadette Dunnigan. Congratulations Division 11 – winner of the Silent Auction Classroom Contest! Congratulations! The winner of the classroom pizza party is Mrs. Scott’s Division 11!, 33% of the families in Division 11 participated in this fundraising initiative, closely followed by Div 12 at 30% and Div 10 at 23%. Thank you to each and every family who participated. We have a great silent auction line up. See for yourself on May 7 at Gala MontRoyale! Order forms will be sent home with students this week, so please check backpacks. Ordering can be done online through EduPac directly, all details will be on the forms. Please note, based on parents' feedback, EduPac will recycle (re-use) the plastic packs that supplies come in so these can be returned to school when the child no longer requires the bag. Special Presentation by Miss Kristen Gill on her upcoming National Geographic Expedition. See full AGENDA. All parents should have received an email from the school regarding the incident at Canyon Heights last weekend. We are fortunate at Montroyal that we have a tight-knit community of parents and educators, however this incident provides us with an important reminder about discussing safety and emergency procedures in our own families. Some TIPS for discussing “Stranger Danger” with your children can be found HERE. Teachers have also been reviewing street safety again with students. Many parents express a desire to see the Outdoor School property before their child goes to Outdoor School (Grades 3 & 6) or Bighouse (Grade 4). The Open House is your annual opportunity! The Open House is a really fun event for the whole family. Event details attached.